Ram 1500 is entering its fifth generation next year. Everything is new on this truck. Styling, interior, trim levels, special editions, drivetrains. However, designers and engineers are not done yet. They left some things for the first update we will see in the following year. First details about the 2020 Ram 1500 are still available. This model will include more powerful hybrid drivetrain. Also, the TRX Rebel should be finally out with the Hellcat engine. One of the most interesting additions for the new generation is an Apple CarPlay service. It will come with more features for the 2020 Dodge Ram 1500. While we are still waiting for the complete info about the 2019 year model, the company prepares surprises for 2020 Ram 1500 edition. As we already got used to, there are special editions. The last one was a Kentucky Derby Ram 1500. What it could be in the future, who knows? At least, there are hints the super-truck with 6.4-liter Hemi engine could be there with 700+ hp output. Also, the hybrid is possible, since the new model will probably introduce a mild version of such drivetrain. FCA, the parent company is definitely making huge steps to set some challenges to its main rivals – Ford F-150 and Chevy Silverado 1500. The 2020 Ram 1500 will keep the same shell as before. No big changes will be made on the base truck and existing trim levels. At least for these, we already know that will come out. Whatsoever, FCA always brings some special editions. For 2019 Ram 1500 that is already Kentucky Derby. While we were waiting for the new generation, the company launched few such pickups to entertain fans while they developed the truck for 2019. So, we had a Harvest, Mojave Sand, Hydro Blue, and few more. Buyers of the 2020 Ram 1500, besides the standard packages, will be able to pick few more options for every trim level. There are six of them available at this moment – Tradesman, Big Horn, Laramie, Rebel, Laramie Longhorn, and Limited. All of them are offering 4×2 and 4×4 drive modes. Furthermore, the truck can come with Crew or Quad Cab, while the Regular cabin is not available yet. However, we can’t imagine the lineup without 2020 Ram 1500 Regular Cab. Furthermore, with cabin size, buyers will choose the dimensions of the box. As always, there are 5’7’’ and 6’4’’ beds. We are coming to the segment where the changes are the most important. But first, let’s start from the existing lineup. The base truck is using a 3.6-liter V6 engine. It is capable to produce 305 hp through an eight-speed automatic transmission. The alternative is a 5.7-liter V8 Hemi engine that produces 90 hp more. Also, it raises the torque level to 410 lb-ft. The V8 engine is going to be a part of the eTorque project. Mild-hybrid version of the pickup will deliver better numbers for city drive. However, a small battery pack is not changing things radically for the 2019 model, so the 2020 Dodge Ram 1500 Hybrid must make a huge step in this segment. This is a more realistic option since the company added a mild-hybrid version for the next season. We are still expecting Ford and Chevy to response. But, these carmakers are still not confirming rumors. Meanwhile, the 2020 Ram 1500 could get a more serious hybrid version with improved fuel economy and other performances. Another big addition that comes with a new generation of a truck is a diesel drivetrain. While everyone expected the Ford F-150 to shy with its new PowerStroke unit, Ram 1500 stole the show at Detroit. Now, the diesel engine is going to be the part of the next model. The FCA didn’t unveil the complete specs sheet, but the turbodiesel powertrain will produce around 250 hp and 420 lb-ft of torque. Similar values will come for the 2020 Ram 1500. The carmaker gave us hints about the upcoming Ram 1500 Hellcat. A 6.4-liter engine, capable to produce 707 hp, will enter the production with 2020 Ram 1500 Rebel TRX model. This concept is available for a while, and it is finally time for it. Dealerships will offer Ram Rebel Hellcat during 2020. The exact release date is still unknown. Another addition for the 2020 Ram 1500 lineup could be a return of Mega Cab model. Recently, a lot of spy photos of Ram 1500 appeared. Not the entire squad is official yet, so some of the upcoming models are beneath the camo of spotted vehicles. 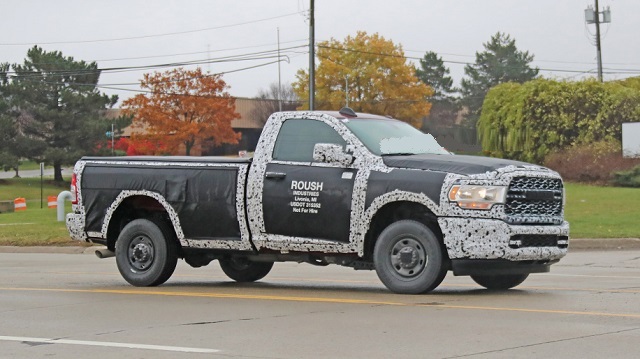 But, few spy photos are showing something very similar to the Mega Cab configuration. If this happens, the 2020 Ram 1500 Mega Cab truck would be the largest in the lineup. Adding an Apple CarPlay feature is definitely a huge improvement comparing to the previous generation. Now, owners of iPhone can easily connect its smartphone to the Uconnect system in their trucks. Siri will help the driver to find the best way in navigation, write messages, and make calls through voice commands. Android Auto offers similar features for owners of Android smartphones. The next edition of the 2020 Ram 1500 will come with even more functions and options. 2020 Ram 1500 Release Date, How Much It Will Cost? The new generation of a truck is still fresh. There is no need for FCA to rush with an update. So, the first appearance of the 2020 Ram 1500 could be somewhere during the second half of 2019. Then, some special edition could be presented as the model for the following season. In 2020 we will also see an updated hybrid pickup. Finally, when everything starts to cool off, the FCA will launch the TRX Rebel model to blow the competition – Ford Raptor. Starting price of the current truck is not changing for 2020 Dodge Ram 1500. However, all these additions and special editions will get unique updates, so their prices will depend on a number of features. Now already we can be sure that the 2020 Ram 1500 Hellcat will be the most expensive model with a six-digit MSRP. The base model will cost around $30,000, and diesel could get a slightly higher price.